So much has been written about the 1916 Battle of the Somme that it might appear that every aspect of the four-month struggle has been described and analysed in exhaustive detail. Yet perhaps one aspect has not received the attention it deserves - the French sector in the south of the battlefield which is often overshadowed by events in the British sector further north. 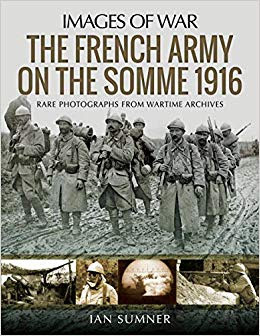 That is why Ian Sumner's photographic history of the French army on the Somme is so interesting and valuable. Using a selection of over 200 wartime photographs, many of which have not been published before, he follows the entire course of the battle from the French point of view. The photographs show the build-up to the Somme offensive, the logistics involved, the key commanders, the soldiers as they prepared to go into action and the landscape over which the battle took place. Equally close coverage is given to the fighting during each phase of the offensive - the initial French advances, the mounting German resistance and the terrible casualties the French incurred. The photographs are especially important in that they record the equipment and weapons that were used, the clothing the men wore and the conditions in which they fought, and they provide us with a visual insight into the realities of battle over a hundred years ago. They also document some of the most famous sites on the battlefield before they were destroyed in the course of the fighting, including villages like Gommecourt, Pozieres, La Boiselle and Thiepval.